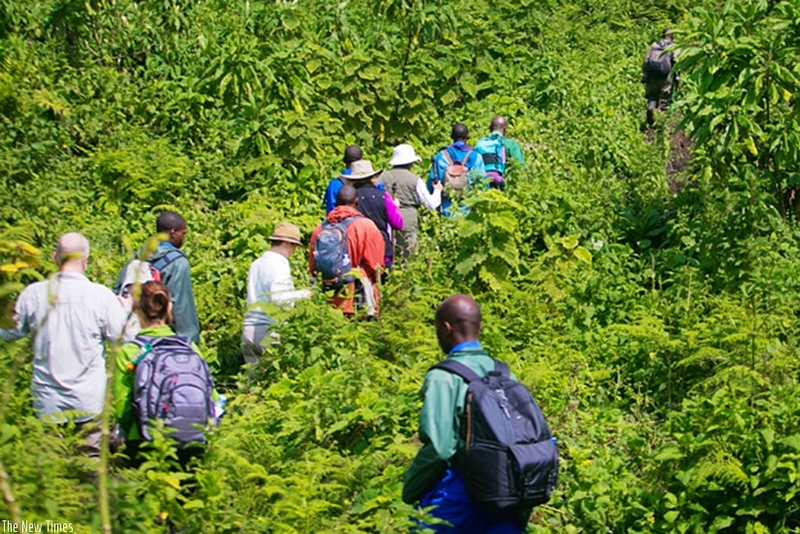 Tourists trek to Karisimbi camp in northwestern Rwanda. File. The 7 Summits Africa project was launched at the Kigali Serena Hotel on Friday. It seeks to harness mountain hiking activities in the East African region into one tourism product. The mountain summits to be covered under the project are; Karisimbi in Rwanda, Mt. Kilimanjaro in Tanzania, Mt. Kenya and Meru in Kenya, Mt. Speke and Mt. Stanley (part of Rwenzori mountain range) in Uganda, and Mt. Nyiragongo in the Democratic Republic of Congo. The launch ceremony was attended by officials from the Rwanda Development Board, mountain hikers, local tour operators, the media and other stakeholders. “We are happy to welcome this specific group of tourists to Remarkable Rwanda as their ultimate hiking package fits strategically with our long-term goal to continue expanding our tourism industry, especially the adventure segment and establish the East African region as the world’s destination of choice for unforgettable experiences and highest standards of service whilst protecting our biodiversity,â€ said Belise Kariza, the Chief Tourism Officer at Rwanda Development Board. Under the project, a team of nine mountaineers from 7 Summits Africa will set out to achieve a world first by climbing the seven mountain summits back-to-back in a period of seven weeks. The team will be in and out of Rwanda a record three times in the course of the excursion. The excursion officially kicked off on the morning of Saturday, November 4, with a drive to Lake Kivu. The following day, Sunday November 5, the group drove to Mt. Nyiragongo in the DR Congo for its first hiking stop. From Nyiragongo, the team will head to Mt. Karisimbi for its second hiking expedition, before heading to Kenya’s Mt. Kenya. From Kenya, the team heads to Uganda, where it will climb Mt. Speke and Mt. Stanley. The team will then travel through Kigali en route to Tanzania’s Mt. Kilimanjaro as the last leg of the expedition. “Kigali for us is a very important destination and it will always be the starting point for every year’s 7 Summits Africa journey, said Carel Verhoef, one of the mountaineers from 7 Summits Africa. The expedition will not be limited to only climbing mountains but will also showcase alternative wildlife experiences one can partake of while climbing the mountains. “We will be on mountains for twenty-five days climbing, but the whole project is forty-nine days; that is seven weeks on the road climbing mountains and visiting the parks in between,â€ Verhoef further revealed. “Mountaineers from all over the world continue to go to the same places like Nepal and the Alps and the Rocky mountains in America. The reason they don’t climb mountains in East Africa is just because they don’t know them. So the main reason why we are undertaking the 7 Summits Africa project is to market and to tell the world that there are technical mountains in East Africa to climb, ‘ he added. “As a region, East Africa is blessed with wonderful mountains and wonderful wildlife and the best people, and that’s a complete package. We are taking East Africa’s mountains and combining them with the national parks to create a very powerful product that will attract mountaineers. Also on the team of mountaineers is Sibusiso Vilane, from South Africa, who has variously been described as “Africa’s most experienced mountaineerâ€ and “the ambassador of Africa’s mountains. “I believe it’s my responsibility to promote my continent. I cannot just talk about it. I must practically do it, he said. “I breath Africa, I eat Africa, I walk Africa, I am an African. Africa is my pride, and that is why I’ve got to do these things that I do. As a young mountain climber, one of the first questions that was asked to me was, ‘would you climb Mt. Everest’ and I said ‘I would do it, but I just won’t do it for the sake of it. The only reason that I did it was because I wanted to show the world what we Africans can do, because I believe we are equal to anybody –be it in sports, adventure, tourism, in business or anything else. According to Verhoef, the exposure and reach from the expedition will help unveil new adventure tourism products that will attract visitors in search of some of the world’s most extraordinary adventure products. “More visitors to the mountains, parks and reserves will lead to improved facilities and services as well as mountain safety. In the long term, tourism and tourism numbers help protect and conserve the habitat and wildlife of these remarkable ecosystems” he noted. The expedition will be broadcast live to a global audience via Youtube and Facebook Live.